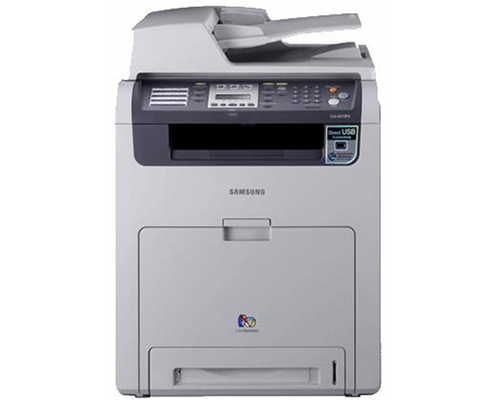 The Samsung CLX-6240fx is a multifunction laser unit with a number of features to ensure connectivity and considerably higher speeds than other Samsung CLX models. Though it is larger, it may be better suited to the small workgroup environment than other printers built to handle larger paper throughputs. The printer measures 18.4" by 19.6" by 25.6" and weighs 81.6 lbs, making it fairly lightweight for a multifunction unit. It may fit on a desk comfortably, but will easily fit in its own cabinet or on a credenza if necessary. The unit produces prints or copies at speeds of 24 pages per minute in A4 and 25 pages per minute in letter. The unit has a capacity of 350 sheets across a cassette and a 100-sheet multi-purpose tray, as well as a 170-sheet output tray. It can print to envelopes, labels, card stock, bond, and archive paper, and to media sized between 3" by 5" and 8.5" by 14". The ADF has a 50-sheet capacity and can process paper sized between 5.6" buy 5.8" and 8.5" by 14". This improves upon the CLX series' biggest flaw -- its remarkably slow color print times -- and brings them above the standard 20 pages per minute offered by most devices. 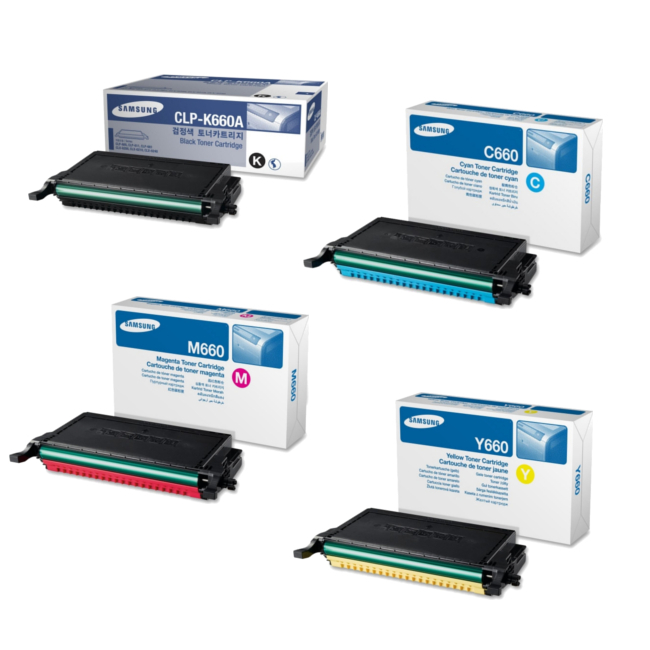 The printer also prints at resolutions as high as 2400 by 600 dpi and can emulate PostScript 3, PCL5c, and PCL6, which earlier Samsung models could not. The copier supports enlargements between 25% and 400% on the platen and between 25% and 100% using the automatic document feeder, with a maximum number of 99 copies being producable at a time. 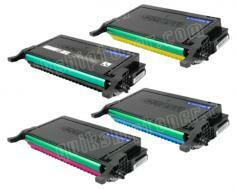 It includes ID copy, clone copy, N-up copy, and poster copy functions. Unlike other CLX models, automatic duplexing is built into all functions, saving time and proving likely to be a substantial convenience. The scanner supports TWAIN and WIA scanning either on the built-in color flatbed or via the automatic document feeder. The scanner can read documents at resolutions of 600 by 1200 dpi when making optical scans and up to 4800 by 4800 dpi at enhanced resolutions. It also supports scanning to USB, to SMB, to FTP, to network, and to email, making it comparable to almost all contemporary scanning systems. The built-in fax system operates using an ITU-T G3 modem at 33.6 Kbps. It faxes documents at resolutions of 300 by 300 dpi in black and white and 200 by 200 dpi in color and has 4 MB of memory. It supports PC-Fax and auto dial, if needed. The CLX-6240fx includes 256MB of memory, expandable to 768 MB, and an 80GB hard disk drive. It connects via USB 2.0 or by 10/100Base-TX Ethernet, and can interface directly with some USB devices via a USB host interface built into the printer. The included hard drive allows for network print job monitoring, as well as security, delayed job printing, and form storage. Optional wireless connectivity is also available, adding 802.11-based network support. It also features a 2-line LCD to configure some settings and perform minor administration on-site. Despite its near-industrial qualities across most functions, the unit's paper capacity is only slightly over half a ream of paper with no options for expandability, making it difficult to recommend despite its many positive qualities for workgroup environments with even slightly large paper throughputs. Many models with features like this one built before it offer capacities in the thousands of sheets, not less than 500. Finishing systems as offered on many comparable models are not available on this system beyond the built-in automatic duplexer, again making this particular model less desirable for environments that produce enough documents to require automated sorting and finishing systems. 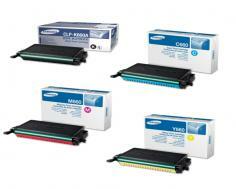 Review it: "Samsung CLX-6240FX "
The CLX-6240fx has four toner cartridges, all of which require regular replacement to ensure black and color printing. The black cartridge is rated to produce 5500 sheets at approximately 5% coverage and the cyan, magenta, and yellow cartridges are rated to produce approximately 5000 sheets at approximately 5% coverage.